THE POOL IS OPEN AND THE WATER IS AT LEAST 80 DEGREES! 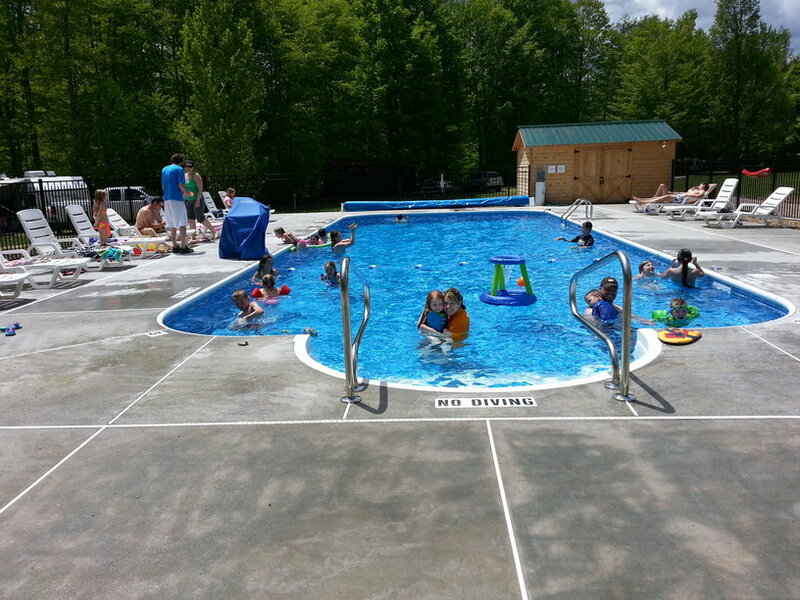 As you may have heard, we have a brand new swimming pool at Forest Ridge! It is a 20′ x 50′ in-ground pool that is 3′ at the shallow end and 4.5′ at the deep end. There are wide roman stairs at the shallow end, as well as a chair lift, to make our pool accessible to just about everyone. The pool has an automatic chemical feeder, so the water is always crystal clear and chemically balanced. Best of all …. Beginning Memorial Day weekend through Labor Day weekend, it is HEATED to 80 degrees! The pool is open every day, unless the outside air temperature is below 70 degrees, or it is storming. Monday – Friday: 11:00 a.m. to 6:00 p.m. Although the pool may be open prior to Memorial Day (weather permitting), it will not be heated until Memorial Day Weekend. WATER ARE ASKED TO NOT USE THE POOL. USE UNDER-GARMENTS DESIGNED FOR SWIMMING POOL USE. * PATRONS SHOULD SHOWER BEFORE ENTERING THE POOL AREA. DO NOT SWIM DURING SEVERE WEATHER CONDITIONS, SUCH AS ELECTRICAL STORMS OR TORNADOES. When the pool is locked, it is for safety reasons. Do not attempt to access the pool during these times. These rules are designed for the safety of our guests, which is our greatest concern. Please be safe and enjoy!